Featured on this year's compilation are 11 audio tracks from 10 ten different artists on the HDR Roster, as well as a guest apperance by the project 'Our Last Day on Earth' created by the mastermind of the symphonic doom metal project 'The Howling Void'. As for the HDR artists featured on this compilation, some artists - such as netra, and Ov Hollowness - have decided to record and release a track which is exclusive to this compilation, while others have decided to showcase a track from their upcoming album release on HDR. An exception to this is Neige et Noirceur whose track 'Hymne II : Neige Noire' was recently released on their new album on Sepulchral Productions. Overall there is over 70 minutes of audio to be heard on this compilation, most of which has not been made public before this release. In addition to the main feature of the compilation - which is obviously the music, there is also a music video from the Iranian project 'Silent Path' which is another project from the musician behind Ekove Efrits - Saman Nu. The video is for the track 'Gray Dolls From Nowhere' which will be featured on the debut Silent Path album 'Mourner Portraits' to be released through HDR in 2012. The album artwork on this compilation is once again created by Marc Hoyland known best for his ambient project 'Hoyland', the goth band '13 Candles' as various black metal projects. The inner pages of the booklet on the compilation features photography from my photography project 'Hypnotic Dirge Photography' which was further edited by Marc Hoyland. Within the compilation artwork, you will find a short note from most of the artists on the album explaining their contribution on the compilation. Other features in the visual side include a gallery of photographs from Elan O'Neal Photography, and Hypnotic Dirge Photography, as well as a couple of shots of 'Nat' - the female vocalist who will appear on the track 'Spirits Dwell' on the upcoming Stroszek release. Finally, to complete the compilation, there is a short text piece by Elan O'Neal entitled 'Sense', a small expressive "poem" by myself - N. Skog, as well as the lyrics to the track 'Can't Make Things Undone' by Claudio Alcara of Stroszek. Overall this compilation is a nice collection of art from a variety of different mediums from the artists on Hypnotic Dirge Records. It should paint a picture and give a preview towards the upcoming releases on HDR in 2012 as well as recollecting tracks from prior HDR releases. Make sure you download this compilation as it is completely free, and share it with as many people as possible. 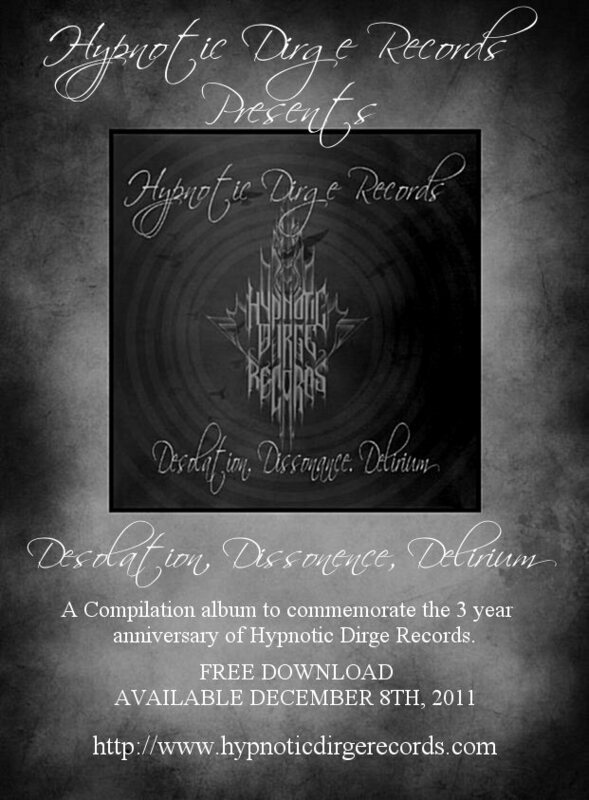 NOTE: The annual compilation album series is released by Hypnotic Dirge to commemorate the yearly anniversary of the label. The 2011 edition of the free compilation album was released as a part of a larger three-year commemoration which includes the first-ever HDR Shirt which can be bought individually, or as part of a complete anniversary pack featuring a shirt, 2 posters, a signed/numbered postcard, photography, and 2 CD's.